A few weeks ago a buddy of mine busted out the MHP on me. For those not familiar, it’s a now-famous mathematics puzzle named after the talk show host who hosted the show it’s associated with. The idea is simple, and is covered in depth at Wikipedia, but for those looking for a simple rundown it’s basic concept is this: you’re given three doors and told one has a car behind it while the other two have goats. You are asked to pick a door. After your choice is made you’re then showed a goat behind one of the other two doors. You are then asked if you want to switch to the remaining door or keep the one you chose initially. The natural inclination is to think that since there are only two open doors remaining, and you already have one of them, that it’s precisely equal odds between them — and therefore not beneficial (or detremental) to your odds to change your choice. That logic, however, is flawed. It is, in fact, beneficial to change your choice. In reality, it takes you from a 33% chance to a 66% chance when you switch, or from 1/3 to 2/3. If you doubt this go spend some time at Wikipedia. Anyway, I was so intrigued with the puzzle that I decided to write a bit of code to illustrate how this plays out in reality. There are many such programs out there already; I just wanted to do it for myself. This code is rather crude, which it turns out is something of a signature of my little wannabe coding projects, but it was fun to write. I don’t have the time right now to write the decision process portion of the puzzle, and currently it just models the staying and leaving dynamic, but you get the idea. 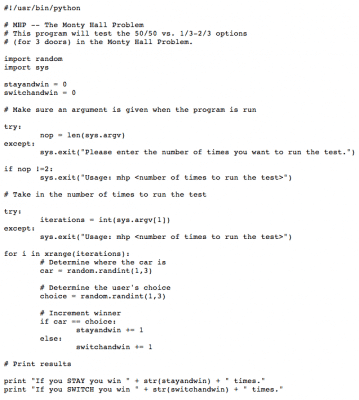 Here’s the code that uses psuedorandom placement of both the car and the contestant’s choice. Very interesting indeed. It is, in fact, better to switch.